Director of Public Citizen’s Global Trade Watch, Wallach said today: “Even before today’s WikiLeaks posting of the TPP copyright and patent text and its threats to affordable medicine and Internet freedom, House Democrats and Republicans have announced opposition to fast track authority for TPP.” The group just posted “What’s New in the WikiLeaks Text” and other breaking content. Flowers served as congressional fellow for Physicians for a National Health Program and is now co-director of It’s Our Economy and co-hosts “Clearing the FOG” radio show. 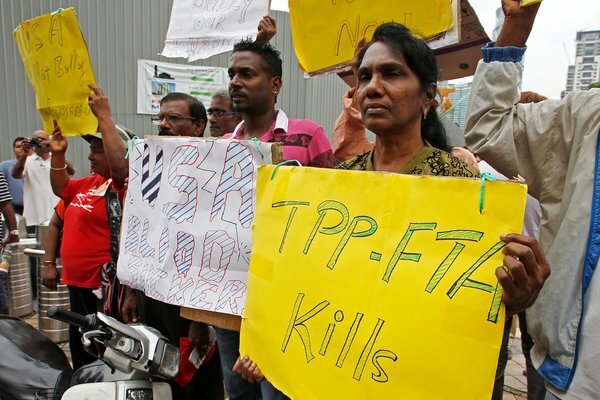 She wrote the piece “Trans-Pacific Partnership Undermines Health System,” which states: “While the TPP is being called a trade agreement, the U.S. already has trade agreements [with most of the] countries involved in the talks. Instead, the TPP is a major power grab by large corporations. She said today: “The TPP has been shrouded in secrecy from the beginning because the Obama administration knows that the more people know about it, the more they will oppose the agreement. The release of the full Intellectual Property chapter today by WikiLeaks confirms what had been suspected — that the Obama administration has been an advocate for transnational corporate interests in the negotiations even though they run counter to the needs and desires of the public. “This is not surprising since we already knew that 600 corporate advisers were working with the U.S. Trade Representative to draft the TPP. This means that for nearly four years some of the top corporate lawyers have been inserting phrases, paragraphs and whole sections so the agreement suits the needs of corporate power, while undermining the interests of people and planet.” Flowers called for a “new approach — transparency, participation of civil society throughout the process, full congressional review and participation, and a framework that starts with fair trade that puts people and the planet before profits.” She is involved with the group flushthetpp.org.